If 3 idiots had the Chatur Balatkaar scene, ZNMD has the Mantal Bwoyz scene that has us in splits. In my case I was in splits, yet at the same time knew that I was laughing at myself too. What Arjun (Hrithik Roshan) was doing with his moshi moshi client in Japan I had been doing for a long time with the Electronic Art’s and the Disney’s of the world, me being the salve on a mission to save the world and my world being my workplace. In the balance between work and life, work was the unanimous winner and I was always the Mantal Bwoy. The most disruptive innovation ever made by mankind is the phone; to be more precise, Cell Phones and the current fad and our future, the Smart Phones. Smart phones are really smart because we can post our smart status (copy/paste) updates on the go from wherever we are. We are always connected to the world we think, especially me with my hyperactive presence on Twitter, Facebook and now Google+. Well, I also know that some of you are addicts of Angry Birds and other games on your phones along with the constant SMS exchanges. But the fact that angers me is this - I haven’t called a single friend home for dinner in the last many months nor said a simple Hi to my neighbours nor do I pay full attention to my family at all times. Social networks have made my life easier by connecting me with the world but somehow I seem to have lost connection with reality around me. ZNMD does not talk of social networking but highlights very well how the phone can disrupt real life conversations. In a way, phones have stripped us of our privacy by connecting us with the world all the time and social networks compound the issue. How and when do we say NO to this? Why just phones? We often don’t say NO in many instances. Could be our upbringing or our culture; we tend to be polite most of the time and don’t want to hurt other people. The same thing when it happens to relationships can turn us into nomads! Infact that is the reason why Kabir (Abhay Deol) wants to go on that trip to Spain, he became a Mantal Nomad. What was his problem? He did not know how to say NO. He does say NO in the end but by that time he suffers a lot emotionally. Why did he not say NO in the first place? Because he was scared, there was FEAR in him. How did he fight his fear? What our friends in the movie do is just the same, they set out to fight their fears and differences, the end result we all know; they became fearless to do what their heart tells them to do. So what did they exactly do while participating in each of the adventure sports that they choose? They let go off their baggage from the past. Talking of baggage reminds me of Bagwati, the other famous character in the movie. Am sure you remember her. The emotional baggage we carry in our lives is usually as expensive as Bagwati the famous bag. We are so attached to our baggage that we can’t let go of it so easily. We tend to worship our baggage and forget that by filling that bag with unnecessary memories we are only burdening ourselves. It takes guts to let go of baggage as expensive as Bagwati. Our three friends from the movie have their own Bagwati’s to deal with, Arjun with his work and the emotional trauma of a breakup before heading into a new relationship. Imran (Farhan Akhtar) carrying the baggage of his roots; once he encounters the truth fearlessly he is free of his baggage and Kabir loses his baggage after being chased by bulls across the streets of Spain. I guess along with “Say no to plastic” we can now add the slogan “Say no to Bagwati” if we are looking for mental peace. You are in Louuvvv my bwoy! Show me one person who has never fallen in love, I shall give him/her my sympathies. Now show me one person who has never fallen out of love, I shall give him/her my sympathies too. Contrary to popular belief reinforced by many a love story, love is not a constant but a variable. Falling out of love is as natural as falling in love. No one tells us this story though. If one follows the character graphs of our friends in the movie, Arjun had a girlfriend who ditched him for his best friend Imran, she later ditches Imran too. Arjun moves on with hurt but gets into another relation only to be dumped once again. What does he get in the end, the beautiful Laila (Katrina Kaif) and our Imran too does not fare badly. Same is the case with Natasha (Kalki Koechlin) and Kabir, life goes on. This reminds me of that famous line... “Girls are like buses, miss one, next fifteen, one comin”. Guess the reverse applies to boys too. So does that mean love does not exist? Maybe? Let me make that a topic for another blog post. Ok, what about parental love, is that a constant? I will say yes, but we have also seen the case of Imran and his biological father Salman Habib (Naseeruddin Shah). Salman has no love for his son, infact he never even bothered to check on him ever. Instead, the man that Imran grows up thinking is his father did a far greater job loving him. Loving someone doesn’t mean taking the other person for granted, be it a parent, spouse, sibling, friend or a lover, it is like growing a garden, both need to keep tending to it continuously to enjoy the fruits. Don’t have the patience for it, then the fruit certainly doesn’t belong to you. What is the best way to keep tending to this garden, it is by being inside a box. Dibbe Ke Andar Ya Bahar? Laila tells Arjun "aadmi ko band dibbe me tab hona chahiye jab vo mar chuka ho.." (Man should be inside a closed box only when he dies) The statement is true and also false at the same time, for someone to think out of the box he needs to box himself first. By box’ing oneself I mean one has to strip away all distractions and focus on the current moment. We do that everyday, we are in a box when we are at work, nothing else matters there, when we are home we are in a box again, with friends it is a different box, we are always moving from one box to the other. It is how well we fit into and slip into each box that matters more. Being outside the box is not the same as being out of the box. Now that I have almost reached the end of my post I shall talk of the beginning of the movie and also the most important box that one needs to be in often. Signing off with a Holiday! The opening credits of the movie show our friends packing for their vacation in Spain. I am going to pack my blog post after this last bit. Packing for holidays is quite a metaphor if you actually think about it. When we go out for holidays we pack all we need in a box, nothing less and nothing more, we pack only what is essential. After that we are in a box with just ourselves and our destination which might include our friends or family, everything else is placed in the attic of our memory and only then do we tend to discover our true selves. 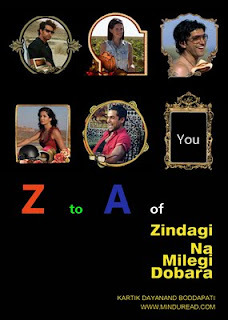 So if you are still wondering what your true self is, head to Spain, I know it Pains the pocket having to travel so far, why not try the nearest weekend destination or maybe a trip to the movie once again, because Zindagi Na Milegi Dobara multiplex mein bhi. I look forward to your comments on the post!!! PS. Farhan Akhtar did not pay me to write this post; my last interaction with him on Twitter was not the most appropriate one. I wish to sincerely thank him and Zoya Akhtar for producing this film, we need more such gems from their Excel'lent stable!! !